Diabetes is a huge problem for Americans. According to the Centers for Disease Control and Prevention, as many as 30 million Americans are dealing with the condition. As a result, it is crucial that the medical field tries to find ways to lower blood sugar in diabetic adults. More Americans are unknowingly close to developing diabetes due to preventable lifestyle habits. Even worse, an estimated 25% of Americans don’t know that they currently have diabetes. What can be done to lower blood sugar? Experts agree that both diabetics and those at risk greatly benefit from a healthy diet. In fact, one preliminary study suggests that cucumbers could lower blood sugar. The study focused on lowering blood sugar in diabetic mice by feeding them the peels of either pumpkin, cucumber or tinda (another vegetable). They found that all 3 peels significantly lowered the mice’s blood sugar, although pumpkin peel worked the best. However, this study suggests that eating more cucumbers could be an easy addition to a diabetic’s diet. 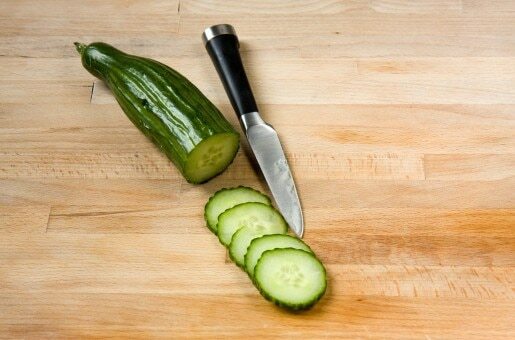 According to Live Science, cucumber makes an excellent alternative to sugary foods because of its low-carb makeup. It also contains vitamins C and K as well as some potassium. Aside from cucumbers being low-carb, they can benefit diabetics with their fiber, which slows the rate of glucose being released into the blood. With its various antioxidants, this food is one that diabetics should add to their diets on a regular basis. The American Diabetes Association recommends a diet low in starches and sugary foods. Diabetics can choose from healthy eating styles like the Mediterranean diet or a low-carb diet. However, the main idea is to infuse each meal with non-starchy vegetables, balancing it out with protein, dairy, and a small amount of fruit or starchy foods. Here’s a helpful trick: Imagine a line that cuts your plate in half, then another line that cuts one side into another half, says the ADA. Diabetics should fill the larger side of the plate with non-starchy vegetables, then add a starchy food and some protein to the two smaller sections. Top the meal off with a serving of fruit and possibly dairy for a nice, well-rounded meal. People who have diabetes may have to watch what they’re eating in order to lower blood sugar. But, they can make that process easier with tasty foods like cucumbers. In general, low-carb vegetables are a great alternative to starchy foods for anyone.